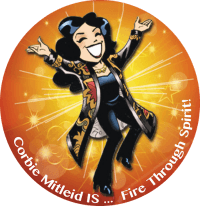 Psychic Medium & Tarot | Divination | Oracle Cards | What Decks Does Corbie Use? There are hundreds — maybe even thousands — of reading decks out there today, both infinite variations on Tarot and the ever-blooming garden of new oracle and divination decks. People notice that I use eight of them in my personal “workbox” and often read with two or three at a time. I always get asked “why these particular decks?” So I thought I’d share them with you here. 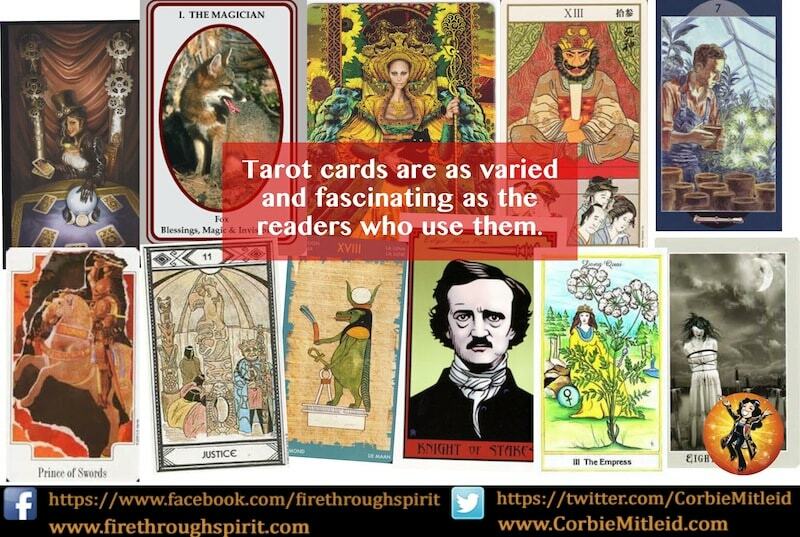 TAROT ILLUMINATI: For decades I used the Morgan-Greer Tarot deck: the faces were clear, the storytelling in the decks useful for teaching my clients. But then, Erik C. Dunne’s masterful interpretation was put in my hands in the summer of 2013 and I was instantly transported. Erik has travelled the world and is a fine artist as in “Fine Art” — the richness of the illustrations, the choice of color and design, even his choosing four distinct worlds for his suits (Wands are Middle Eastern in flavor; Pentacles are Asian; Swords are Tudor England and Cups are fantastical but with a Russian/Scandinavian flair) gives depth and nuance to one’s readings. Even though I’ve been reading for 40 years now, I find my readings are broader in scope with a different level of information when I use this deck. It swept the awards for Best New Tarot Deck the year it appeared, and it’s the deck I highly recommend. THE FAERIES’ ORACLE: This is one of the first non-Tarot decks that ever really called me. I wasn’t into what I call “glurpy purple” type faeries. These folks were the Sidhe — the Wild Ride — the Fae of the United Kingdom that can strike terror into the heart if not respected. Brian Froud, who did the art design for the creatures in Labyrinth and The Dark Crystal, has a style that evokes both light and dark, as do the Faerie themselves. Jesa Macbeth, who has written the interpretive text, clearly has solid communication with the faeries portrayed, and her card discussions are full of insight and humor in equal measure. It’s the deck I use when someone has serious metaphysical questions, or is at a loss about where on their Spiritual Road they need to go next. Not a deck for “rookie clients,” but for those who are unafraid of receiving Real Answers. EARTH MAGIC ORACLE CARDS: This deck by Steven Farmer is element-based, and rich in natural lore and depictions. The artwork is layered and lush, and I will often pick it up when I want to show a client what the “elements” are in their life currently: Earth (how they ground themselves), Air (how they think about things), Fire (where their passion lies), Water (their emotional balance) and Aether (what Spirit brings to the equation). A very good deck for beginners who want a little something other than angels or fantasy creatures. THE JOY OF RELATIONSHIP CARDS: Created by John Gray of Men Are From Mars, Women Are From Venus fame, this is a splendid deck for exploring the situation between (or among) people or looking more closely at Karma. The artwork is stylized and beautifully colored, with certain themes repeating themselves organically through the deck. They are larger cards, and so the artwork is very good for explaining the nuances to your clients. I will often partner this with a standard five-card spread for a relationship, with these cards underneath showing the Karmic plans and pathways involved. SPIRIT OF THE WHEEL MEDITATION DECK: Susan Seddon Boulet was a renowned visionary artist of the ’80s and ’90s who had a deep connection with spirits, shamans, gods and goddesses, and the cosmic realm. Her untimely death at 55 left a great hole in the art world, but in my book, Jody Bergsma is her clear heir apparent. She and Linda Ewashina have created a gorgeous deck with a Medicine Wheel central theme, and Bergsma’s art honors the First Nations tribes of Northwest North America with beauty and grace. The deck is done in muted tones, with many power animals and First Nations figures populating the cards. It is my own personal/sacred deck, the only one I do not let clients handle, and I use it specifically to find a spirit path for clients. The five cards the deck asks me to pull are What brings the client into this life; What is their Passion; What is the Teaching; What is their Legacy; and What is the Hub of their personal Wheel. For years, I used two of Doreen Virtue’s decks. However, in 2016, she was “born again,” and summarily denounced her former work, saying that anyone who still used such cards were Devil-worshippers and damned…though we could buy her new Jesus-oriented decks if we wanted to work in a clean and blessed manner. I found that to be both hypocritical and venal. Therefore, I do not recommend Doreen Virtue under any circumstances. That, however, required me to replace two of my decks. I have found these new decks to be extremely useful, and clients have enjoyed the new energy. ENERGY ORACLE CARDS: This deck by Sandra Anne Taylor is beautifully realized, with clear artwork done in a lush style. I especially liked the fact that the cards were not simply things like “abundance” or “love” but had real concepts to chew on: “Adjacent Possibilities,” “Door to Value,” “The Thinking Woman” and so on. When you put these cards together in a spread, they give the client completely new concepts to consider, which opens them to change. These cards tell real stories with their depth, and I use them for my seven card “storyboard for the year” spread to finish a reading. ANGEL CHATTER ORACLE CARDS: I feel that Christine Alexandria is the next authentic and empowering Angel Expert to step into the spotlight, and take up Virtue’s discarded mantle with humor, compassion and confidence. Her 44-card deck features 14 archangels with specifically channeled messages, including channeled Sigils for each archangel discussed. The 96 Page Guidebook provides a variety of additional meanings for each card and detailed information for each angel; their Chakra Connection, Sacred Light Temple, Name Meaning and more. A deck that is clear and does not succumb to the usual “Hallmark card angel” illustration, it allows the energy to pour through the deck unencumbered. Whenever I need an Angelic take on a client situation, this is the deck I reach for first. If you like any of these descriptions, then by all means get one (or more) for yourself. Decks are doorways to both inner and outer magic — explore and enjoy!